IF ASKED to describe Boroughmuir’s emphatic triumph in Saturday’s BT Cup final then “professional” would be it. From first minute to last the Edinburgh club imposed themselves on their shell-shocked opponents with no let-up whatsoever. Even when the spirit of their opponents had been broken – not an easy thing to do when those opponents are Hawick, for whom dogged indefatigability is in the blood – there was no mercy from the Meggetland men as they kept the foot on the throat and steamrolled their way to a fourth cup win and first in ten years. In the dying moments they continued to run hard at the demoralised Hawick defence and brought up the half century with two minutes left. It could even have been 60 points if it weren’t for the slightest hint of foot-in-touch in the last move of the match – perhaps a case of the touch judge showing a shred of pity for the losers that was utterly absent from a brutal and brilliant Boroughmuir display. For the Borderers, whose supporters turned up in numbers, it was a day to forget. When the Hawick Saxhorn Band struck up early in the match the men from Edinburgh were already calling the tune and scored their first try in just three minutes when they got the nudge on at the scrum and No 9 Johnny Adams ghosted over. The Green Machine was stuttering as ’Muir racked up a point a minute in the first 29 – Magnus Bradbury hitting a perfect line for the second, Grant McConnell finishing a fine sweeping move on the right and then Bradbury picking up and finishing neatly after Carl Bezuidenhout’s clever kick through. Hawick got a try back when Scott McLeod danced through next to the posts, but any suggestion of a momentum shift was snuffed out when prop Simon Berghan crashed over as the Boroughmuir forwards tightened the screw. A half-time score of 36-10 suggested the game was practically over as a contest and so it proved in the second half as Hawick were again put on the back foot by ruthless Boroughmuir. Sub Mike Entwhistle had already touched down by the time Hawick got over for a consolation by Lindsey Gibson. Iain Moody and Sep Visser burst over in the closing stages to rack up a hefty winning score of 55-17 that in no way flattered. The P word was inescapable afterwards given the impact the victors’ professional trio had on the game. Stand-off Bezuidenhout conducted proceedings with panache and plundered 13 points with the boot, prop Berghan was dominant in the tight and collected a try, while Edinburgh academy pro Bradbury was simply sensational. It would be wrong to suggest these pros made all the difference, because Boroughmuir were superb all over the BT Murrayfield pitch on Saturday. But there is no doubt their involvement provided a key advantage over a Hawick side with none of their draft pros available. Boroughmuir’s excellent scrum-half Adams was picked as man of the match by Scotland full-back Stuart Hogg, but 19-year-old No 8 Bradbury can’t have been far away in the reckoning after an outstanding performance. He will be graduating from elite development player status to a two-year full-time contract in the summer and on the evidence of Saturday looks to be destined for big things. 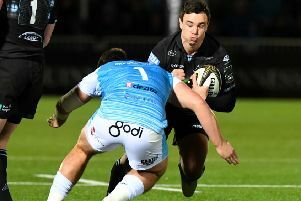 The former Oban Lorne forward, who moved to Merchiston Castle on a scholarship, made his full Edinburgh Pro12 debut by starting against Leinster away at the end of October and was a member of the Scotland Under-20 side that won three games in the Junior Six Nations, captaining the side in the closing win over Ireland. Bradbury’s focus now shifts to the IRB Junior World Championships in Italy in June but he was delighted to sign off from his Meggetland stint with a BT Cup winner’s medal. Scorers: Hawick: Tries: McLeod, L Gibson. Cons: Armstrong (2). Pens: Armstrong. Boroughmuir: Tries: Adams, Bradbury (2), McConnell, Berghan, Entwhistle, Moody, Visser. Cons: Bezuidenhout (5), Laidlaw. Pen: Bezuidenhout. Hawick: L Armstrong, D Graham, N Walker, J Coutts, S McLeod; R Hutton (capt), G Cottrel; S Muir, R Graham, M Landels, M Robertson, M McKee, N Mactaggart, R Scott, B McNeil. Subs from: L Gibson, N McLennan, W Blacklock, R Gibson, K Davies, S Goodfellow, M Douglas.